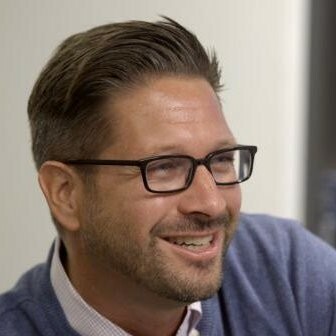 In our previous two posts about Mark Roberge’s Executive Summit presentation, we covered his first two growth milestones, both of which occur in the “Experiment” phase of a business. The third milestone occurs during the “Scale” phase, when you are growing your business and building a moat to preserve your success. 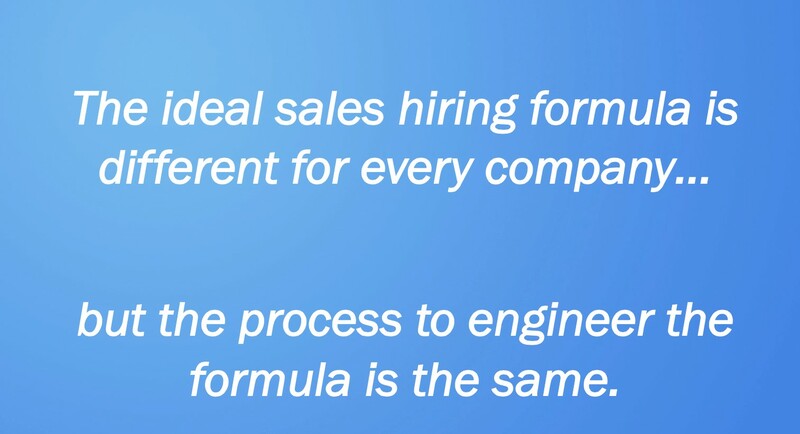 Just as there is no universal formula for sales success, there is no universally ideal sales hire. There are, however, metrics you can track to increase your rate of successful hiring. We don’t often think of hiring as a hard science, but by making it analytical, we can better understand and predict patterns. To create a quantifiable interview process, determine 10 key characteristics for a particular role and score each during the interview (ex: intelligent, coachable, curious). Six months in, keep track of how those characteristics translate into sales success. 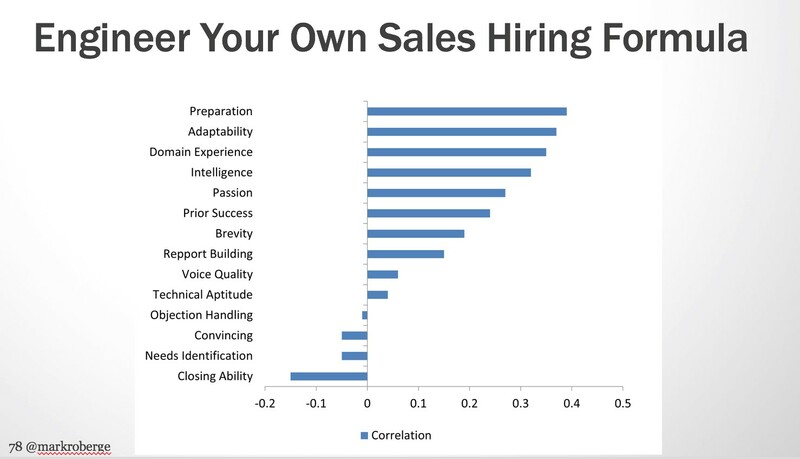 Then, adjust your scorecard according to the attributes that correlate with successful hires. In time, you will build statistical evidence for culture, and a scorecard for your ideal salesperson. Plenty of managers complete this process informally, but to benefit from the science behind it, you need to be disciplined about capturing the data up front and revisiting it in the future. Codify on-boarding and use it as an early indicator of hiring quality. Once you have made a new hire, create a scoring mechanism to track the skills you expect your hire to exhibit after on-boarding. Have the trainer (not the hiring manager) assess every new hire. Can you pinpoint a training score that correlates to long-term success? How about a training score that validates your hiring decisions? Establish a Sales and Marketing SLA and monitor it daily. Don’t make your team guess the goals they’re aiming for. Agree on your Sales and Marketing SLAs and track them daily. Allow that report to be available across the company so everyone can transparently observe how performance is relating to goals. 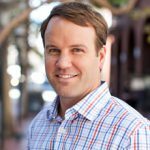 Being clear about these goals will help your company move beyond the typical friction that exists between Sales and Marketing and toward a dynamic of shared accountability. Create a data-driven coaching culture. Once you are clear on your goals, work with your managers to create a coaching culture that serves these goals, built—of course—on data. Managers should be specific in the goals they set for their employees, and should track progress on a monthly basis, offering concrete feedback and providing employees with specific metrics to aim for before the next meeting. By pointing to metrics (as opposed to subjective observations), employees are able to work toward tangible goals, alleviating the frustration that often arises from vague communication. Don’t let the coaching culture stop there. Have your directors regularly coach your managers, your VPs regularly coach your directors, and be sure everyone is on the same page about performance as it relates to the company’s goals. Consider small cross-functional pods over large functional units. 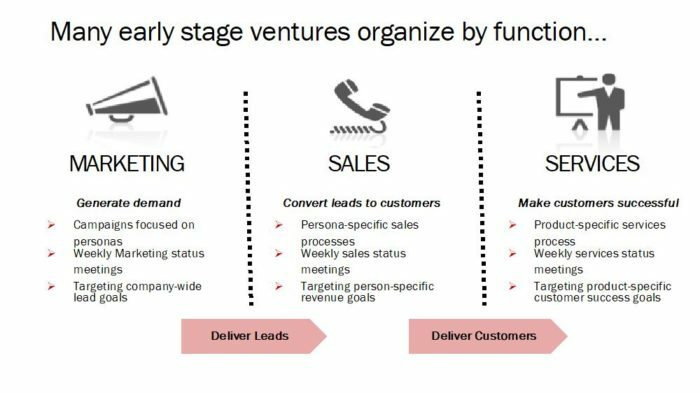 Many ventures organize by function (marketing, sales, services) but this entire exercise has been about customizing your go-to-market approach based on a specific customer segment. 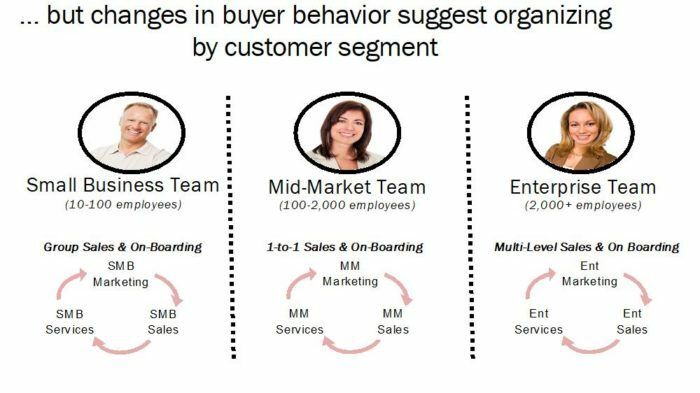 One way to engineer this approach is to reorganize your business into customer pods mapped to your target segments: a small business team, a mid-market team and an enterprise team. Promote based on merit, not tenure. You are now building a company that sets goals, tracks metrics and transparently discusses success. Take these concepts to the next level by creating a promotion path that is centered around data. Sales success and failure is highly quantifiable; take advantage of that. Remove tenure and subjectivity from your promotion paths and replace them with quantifiable metrics that any team member could achieve. There will never be a magical formula for acceleration, because every customer requires a unique approach. However, there are tools and practices you can apply to uncover your company’s various successful formulas. Mark encouraged the Executive Summit attendees to apply a data-driven mind to every aspect of their businesses. He believes the more you measure your day-to-day practices, the better you understand your strengths and opportunities, and the more intelligently and efficiently you can serve your customer and accelerate growth. The goal isn’t necessarily to solve for the perfect company. Rather, it is to constantly measure and learn in an effort to build an ever-stronger company. These three pieces highlight our key take-aways from Mark’s presentation; we encourage you to watch the full video of his presentation.